Leigh's Fiber Journal: Hurrah for Hardy! Hurrah for Wine! You may or may not know that I use Ubuntu Linux for my operating system. I have been absolutely, totally happy with it, except for one thing: weaving software, most of which is written for Windows. Except for the Advancing Twills workshop, where I had to do my drawdowns by hand, this actually hasn't bothered me too much. Plus, I haven't relished the learning curve that comes with any new software. I do have Windows as a dual boot on my computer, but I haven't found my need for weaving software worth the nuisance of that. I did try ArahWeave, which is written for Linux. You can read that post (with lots of screenshots) here. ArahWeave however, though free and loaded with features, is a dobby loom program and so didn't meet my immediate needs. Still, sometimes a weaving program would be handy. Such as for the Towel Exchange I'm participating in, because I need to include the draft on the project sheets we're going to exchange. This is when a program like Wine would come in handy. Wine (acronym for Wine Is Not an Emulator) is free, open source software which enables Windows programs to run on Linux, Mac, etc. It has been included in all the versions of Ubuntu I've had. 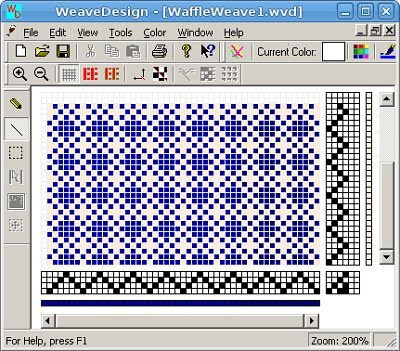 However, when I downloaded WeaveDesign awhile back, I couldn't get it to run with Wine. Disappointing, but not enough to take the time to do anything about it. One thing about WeaveDesign however, is that I can't use it for skeleton tie-ups, such as I'm using with my latest summer & winter weaving. It won't allow me to click on more than one treadle per shed. But with the success I've now had in getting WD to open up in Wine, I'm encouraged to begin exploring other weaving programs and downloading some demos. Any suggestions? You always have some cool thing to share. I'm always learning something new from you. I'm getting closer to being in my home and that means closer to getting a loom. I use PixeLoom. Absolutely excellent support and it does allow multiple treadles (grin!). I got it when it first came out because it was so much cheaper than the rest.....then. Not now. I managed to get a number of free updates because I found issues with the program, and she would give you an update for free if you found an issue. I would suggest your getting trial versions of each of them you are interested in and seeing which you like best. Unless you want something horribly sophisticated (and equally horribly expensive!) I suspect they are all quite good. Leigh, I am so happy you got WD to working with WINE, I too tried awhile back, it worked but not without glitches. Okay, I will have to try it again with Hardy Heron. I use so many different softwares for sewing, knitting and now weaving, and I can't stand using Vista! My DH was talking about using QEMU, but he hasn't had time to install it. Oh I am so excited. I looked at Arahweave, but it's too much software for this novice beginner. LOL! Jewel, I can't wait until you get a loom. You will love weaving. Peg, thank you for that recommendation. After I finish Christmas projects I will have to start testing weaving programs. I like it that PixeLoom allows for multiple treadling. That feature is going to be a must! Cerita, I hadn't heard of QEMU but I found it in Synaptic Package Manager. It looks pretty techy (which I am not!) When you get it installed, please let me know how easy it is to use. I'm also curious about how you run your other fiber arts software. Wine? Virtual Machine? We use Ubuntu as well. I haven't been loom weaving for very long and I had no idea that there were any weaving programs available. Thanks for teaching me something new! Leigh, I just installed WINE and have WD running with no problems! I will definitely let you know how it goes when he installs QEMU. I use all my other programs under Windows, but it's such a pain!! I am going to see if they will work under WINE. If not I will use VMware, which I used before and it was fantastic! Cerita, I'm delighted to hear that. Please let me know about your other programs. I'll be very interested in your results.